Have you heard of the Mighty Lucky Quilting Club? In this really fun monthly subscription, a quilt designer or teacher provides a challenge for us to work through using different techniques and design ideas. The whole thing is meant to stretch us, to teach us new things and to get us to try new techniques. In January, we were taught how to make bias tape and then use it to design a block or a quilt. At first, I wasn't really looking forward to it at all. The whole technique looked tedious to me to be honest. But then I got started drawing out a few ideas and then pulling out fabric and basically playing around. In the end, I decided to go black and white and made one block. And much to my surprise, I really liked using bias tape. Oh the possibilities! And then made three more blocks and sewed all four blocks together. And I was in love! For the quilting, I used my FMQ foot and white Aurifil 50 wt thread to quilt curves echoing the bias tape. The binding is Kona White, the same as the background fabric, with just a touch of black. This mini finishes at 19" square. And with that, the January Challenge is complete! And I will link this little finish at Crazy Mom Quilts for Finish It Up Friday and at Busy Hands Quilts for TGIFF. I've been wanting to make myself a new tote bag for a while now. I finished piecing a pretty large quilt top this week and before getting started on the quilting, I figured it would be nice to complete something fast and simple. I pinned this pattern on Pinterest a few weeks ago and it looked super easy and fun so I searched through my stash for the perfect fabric. Under a pile of other stuff, I found some canvas I purchased a really long time ago for another project and paired it with some Kona Coal. You can't really tell from this picture because the light isn't great, but the print has a really nice mint green background. Love!! The only thing I'm not crazy about is the size. It's a little smaller than I thought it would be. It's about 14" wide and 10" high, so not very big, but it might do the trick for a day at the island when I don't want to carry my big purse. Best part? Every piece of fabric came from my stash and I used scraps of batting. And now that I've got my quick and easy finish, I can go back to a big project! Linking up at Crazy Mom Quilts and at The Quilt Journal for TGIFF. 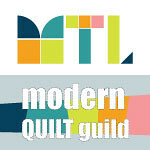 The very first swap of 2016 for the Montreal Modern Quilt Guild took place earlier this week. Members were invited to make a mug bag and everyone who makes one, also receives one. The only rules were: the mug bag must be pieced and quilted. I love quilted bags so I had to participate. I found a tutorial for a small bag at A Quilting Life and thought it would be perfect. This isn't a mug bag specifically, but many of our members don't actually use mugs during meetings, they bring a water bottle. So the bag needed to be big enough for a water bottle. The tutorial calls for 2 1/2" squares and I had a mini charm pack of Zen Chic's Juggling Summer in my sewing room so I went with that. I also used fat 1/8s of the same collection for the top band, the cord casing and the lining. I used fun ruler twill tape for the cords. I love them! I received a bag made by Maggie and I love it. Those colours are just so happy and pretty! And it's the perfect size for the water bottle I take to guild meetings and sew-ins. I managed to take a picture of all the mug bags made by the members. We have a bunch of talented ladies! Did you ever participate in swaps like this one? What are some of your favourite items to make and receive for these swaps? Would love to know! And since this is a finish, I will be linking up at Crazy Mom Quilts for Finish It Up Friday and at Faith and Fabric for TGIFF. Granny Squares Blanket: I started this blanket a couple of years ago... yes - years! I started joining the squares a few months ago, but it's been sitting in my sewing room ever since. I would really like to get this thing done before winter is over! So it's on the list. Spiraled: I put the top together last month. I would really like to finish this one this month. I need to piece a backing, quilt it and sew the binding on. Random Plus Quilt: I pieced this top a few month ago. I now need to piece a backing, quilt it and sew a binding on. This quilt will most likely go to the Island House so I'd like to be finished by April. Baby Heart Quilt: I found out I'm going to be a step-grandma in April so of course, I'm making a baby quilt. The top needs to be pieced and then quilted. Another Random Plus Quilt: The pieces are all cut up for a matching Plus quilt to go to the Island House. We have bunk beds and it would be nice for each bed to have a matching quilt. Orange and Pink Quilt: I pieced this top during the Fall and I LOVE IT!! But it now needs to become a quilt! And that's it! I ordered batting last night so I'm pretty confident I can have these done in 3 months. I'll have all of the supplies I need so no excuses! I will be linking up with the wonderful ladies of the 2016 FAL crew!! A few weeks ago, during a Montreal Modern Quilt Guild meeting, the name Joe Cunningham came up. Now please don't throw anything at me, but I had no clue who Joe was. But many of the members knew of him, one of our members even met him in person, and they all spoke of him very positively. So when I got home, I immediately went on my computer and Googled him. One of the things I found during my research was a Craftsy class taught by Joe himself. The class description was intriguing so I signed up. After watching a couple of lessons, and feeling completely motivated to try out his method, I went searching through my fabric stash for something I could use to try it out. I found a yard of a brown print with pink roses along with a beige solid and went for it. I even went crazy a little and added a few pops of bright pink! I loved creating this quilt - but do not love the colours or the fabrics I chose. Totally not my style. But I couldn't let all this fabric and all that work go to waste so I pieced a backing, basted it and decided to use this as a practice piece for free-motion quilting. I separated the quilt into seven horizontal sections with some wavy lines and then used seven different designs to fill in the sections. I even used contrasting thread to make sure I would see all the mistakes and try to get better by the end of the section. And it worked! The stitching got more and more consistent as I went along. Has this ever happened to you? Did you ever not like a project, but pushed through and in the end, when it was all finished, you loved it? 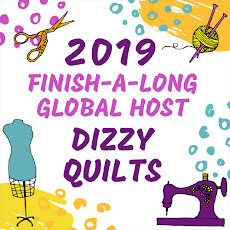 Linking up at Crazy Mom Quilts for Finish It Up Friday and at Quilt Matters for TGIFF because celebrating a finished project with others is so much fun! In late October of 2015, after months of research, I decided to invest in a high-end sewing machine. I have been quilting now for a few years and my inexpensive sewing machines have done the trick, but I've run into issues with tension, skipped stitches and irregular stitching. I was also getting really frustrated with the smaller space in which to stuff a quilt when quilting on a domestic sewing machine. I compared the Bernina, Janome and Juki machines, read lots of reviews and in the end, I decided to go with the Juki TL-2010Q. The Juki is solid, sturdy and feels like a well-made machine. The harp space is 9" wide and 6" high - I quilted a 60" x 80" quilt on it very easily. The dials are easy to use and all the features are right there on the front of the machine. For example, to lower the feed dogs, just use the switch right there on the front. The automatic thread cutter is amazing! Don't know how I lived without it for so long. It has a knee lift for the presser foot. The stitches are consistent and I've not had to mess around with the tension at all so far! The extension table that came with it is really big. The Juki comes with a bunch of presser feet including a walking foot, 2 FMQ feet, a 1/4" foot and a zipper foot. It has 2 spool holders which enables me to wind a bobbin without needing to re-thread the machine. The light on it is really bright! In fact, the bulb in the lamp on my sewing table burned recently and I didn't have any spares on hand so I sewed just with the light on the machine! Most of the features are right there on the front of the machine. Two spool holders means you can wind a bobbin without re-threading the machine. It's more expensive than what I've ever paid for a sewing machine. The only dealer I could find in Montreal sold these for about $1,500 CAD. It's very heavy - I obviously won't be taking this baby to guild sew-in days. It only does straight stitches. For fancy stitches or even zigzags, I'll need to continue to use my Singer. Threading the machine isn't easy! It needs to be oiled A LOT!! The manufacturer recommends oiling it every day if you use it every day. I must use specific bobbins for this machine. Thank goodness, it comes with 6 of them. Threading Juki TL-2010Q is a little complicated! If you're in the market for a new machine and don't mind the straight stitches only, I would definitely recommend the Juki TL-2010Q. If you own a Juki, I would love to hear what you think of it. If you own another brand, what do you love about yours?